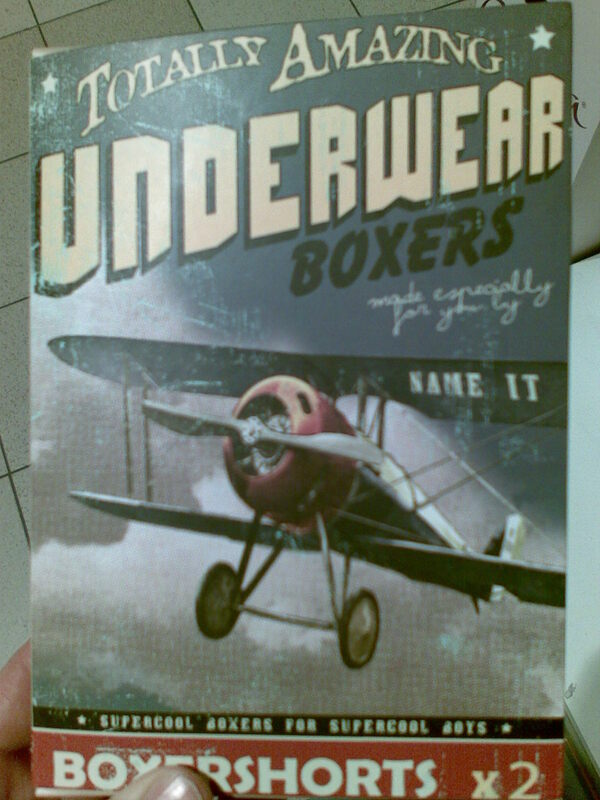 ...with this nice pulp-styled boxer shorts package I discovered while I was shopping for Christmas gifts. I thought for a minute I'd buy them for Kauto, my son, but I wasn't sure whether he likes boxer shorts, as he doesn't wear them, so instead I just took a photo. I think this is very well done. So: Merry Christmas and all that! Before my Christmas wishes I wanted to say something short about a stupendous film I recently saw: it's a Cuban agit prop/art film The First Charge of Machete from 1969, directed by Manuel Octavio Gómez. 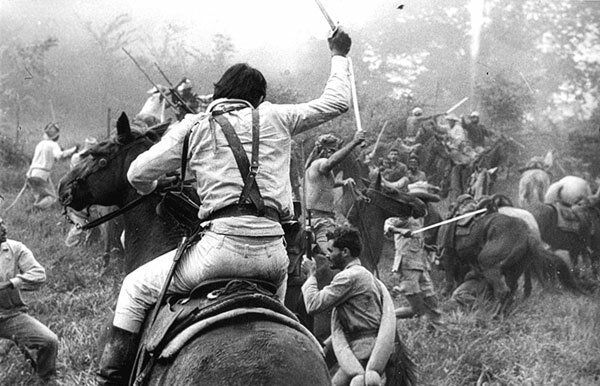 It's a retelling of the Cuban rebellion against the Spanish in the 1860's, but the point in the film is how it's made: it's as if the style of the sixties' cinéma vérité style had been invented already in the mid-19th century and the movie was made as if the rebels, the Spanish officers and several people on the street were interviewed by the film crew, and there are lots of hand-held camera shots. The main point in the film, though, is that the film has been artificially rendered almost totally black-and-white, there are scenes in which the pictures have no grey areas anywhere. You could almost say: "Sin City, eat your heart out! These guys did it already!" The Cuban film meets of course quite a few problems, especially the question why the film has deteriorated so badly if the film as a medium existed already in the 1860s? If they have come to the same narrative conclusions as the original cinéma vérité directors of the 1950s and 1960s (Jean Roach, the Maysles brothers, D. A. Pennebaker etc. ), why does the film look it's over hundred years old? It would mean that they made the first films already in the late 18th century, not late 19th century, as the case is now. But this doesn't really marr the film's impact. The battle scenes are very, very exciting, one of the most exciting ever put on celluloid. 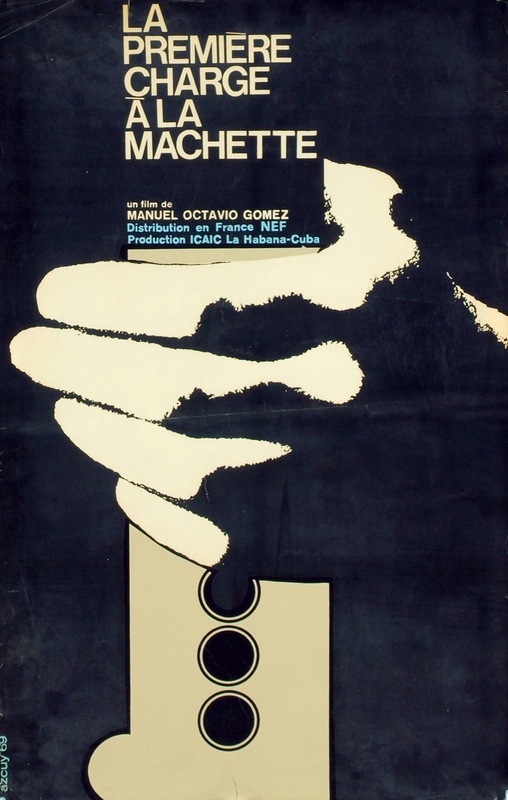 "Possibly the most "aesthetic" and "experimental" of revolutionary Cuba's films, this outstanding work utilizes high contrast photography, overexposure, and solarization to create the faded chiaroscuro and poetic authenticity of the period it depicts. The film deals with an 1870 uprising against the Spanish occupation troops in Cubam in which the machete originally used to cut sugar cane, becomes a weapon of people's warfare. The portrayals of decadent upper classes and heroic peasants are sharp and incisive, and distancing devices - such as the characters addressing the camera - are used the induce attitudes of analysis instead of involvement. The emergence of such a strongly poetic work within the Cuban film industry testifies to the divergent aesthetic tendencies permitted expression within the revolution." eBay has a DVD on sale. 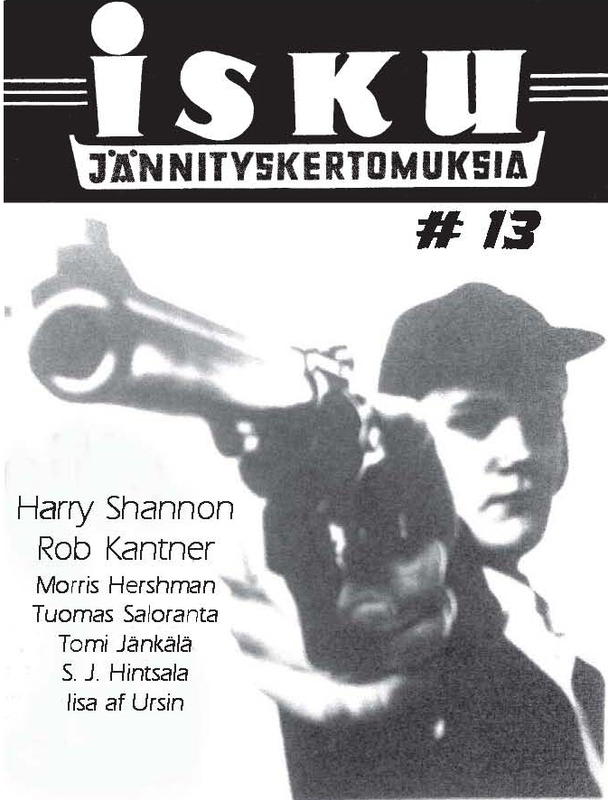 The new issue of Isku out now! Here's a link to the latest issue of Isku, my crime fiction webzine. Check it out: stories by Harry Shannon, Morris Hershman, Rob Kantner, Tuomas Saloranta, S. J. Hintsala and the Nova winner Tomi Jänkälä! It's a treat, even though I say it myself. And here's also the cover. I've said earlier that I really don't care about the recent private eye characters whose problems are worse than their clients. The major exception here is Reed Farrel Coleman, but on the whole I'd rather the private eyes would disappear if they turned sideways. 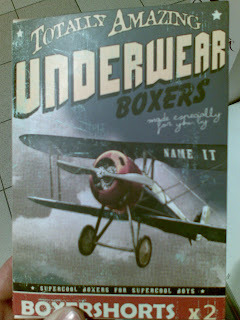 This didn't stop me enjoying Dave White's two novels, When One Man Dies (2007) and The Evil That Men Do (2009). In them, the private eye hero Jackson Donne suffers from many problems: he's only 28 and yet he's an alcoholic, his former colleagues at the police hate him, he's done nothing much to educate himself, he's alienated from his family and his girlfriend left him and died later from something Jackson Donne did. In When One Man Dies Jackson Donne is having a drink and consoling himself for his ex's death, when an old, a bit weird but harmless man is run over by a car outsider the bar. Donne feels he has to look into the old man's death - he used to share drinks with the guy, after all -, but he runs into trouble when his old nemesis at the police force starts to investigate the same accident, only to do harm to Donne. Dave White spins an interesting story with many interlocking incidents, and even though the twists in the story sometimes feel a bit forced, it remains intriguing to the end. Jackson Donne's past mistakes in the police force are drawn into the center of the story, and it seems like he can never escape them. The Evil That Men Do is the more powerful novel of the two and Jackson Donne is really deep in the story of his sister who asks Donne to check into what their old and ill mother has been talking about their granddad. Donne's PI license was taken out in the aforementioned book, but he decides nevertheless he can do this last favour to his family and to his dying mother. He finds out soon that there's a maniac on the loose to avenge something ancient to his family - but just what it is is clear only in the end, if even then. White tramples the ground between the plausible and the implausible, but manages to stay on the clean side with this. There's one thing I didn't get accustomed easily: When One Man Dies is narrated both in Donne's first person narration and the third person narration in the other sections. In The Evil That Men Do Donne is being narrated through a third person narrative, which makes more sense. There are also scenes set in the late thirties, when White tells just what tragic happened in the past. Dave White is, by the way, a good example of how one can rise from the on-line ghetto of crime literature. The bunch of Jackson Donne short stories were first published in different venues in the web before White published his first book. And here's hoping he'll publish many more! I've said it as a comment to a blog post here and there, but let's make it official: besides their great Hard Case Crime line, Charles Ardai should've set up also a line called Hard Case Western. 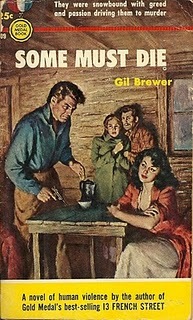 Many of the Western novels of the late fourties, fifties and early sixties could also be catered to the audience of the hardboiled and noir literature, and many of the books from bygone decades would very well be worth reprinting. 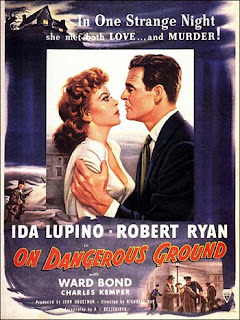 This idea came to me many years ago, but I was reminded of it, when Cullen Callagher started posting reviews of hardboiled westerns on his delightful blog, Pulp Serenade. You can see some of the reviews here (Harry Whittington: Desert Stake-Out), here (A.S. Fleischmann's Yellowleg, basis for an early Peckinpah film), here (Frank Castle's Dakota Boomtown) and here (Gil Brewer's rare entry into the genre, Some Must Die), but do read all of his blog, I guarantee it's worth your while. 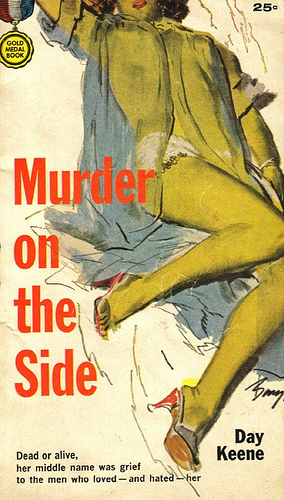 Any early Western by Brian Garfield would also fit the bill, and so would anything by Donald Hamilton, whom Hard Case Crime has already reprinted. A later addition could be Jack Ehrlich's The Fastest Gun in the Pulpit from 1973: funny and violent. I'm also sure many new writers would like to try their hands at a Western, and I'm sure someone like James Reasoner has a noir Western in him, and so do Joe Lansdale, Tom Piccirilli and others. Having said all of the above, I do know that the market for Western paperbacks is limited and that the market for paperbacks is diminishing, but who says one can't have a dream? The Psycho Noir blog has posted fascinating lists of essential noir novels by some writers and other noir aficionados. You can see the lists here. I posted my list on Facebook and thought I'd post it here as well. It's merely a scratch and I did it in a hurry and I'm sure it's missing many important titles. Hardboiled is not included, hence no Chandler, Hammett or Ross Macdonald. One late addition, not mentioned in Facebook, would be Reed Farrel Coleman's The James Deans - in it the ordinary PI stuff forms into a great and depressing noir read. Kevin Wignall: Who Is Conrad Hirst?/Kuka on Conrad Hirst? I just finished editing and publishing the newest issue of my fanzine, Pulp, that's been an on-line publication only for the past few months. Here's the link to the issue's editorial - it has links to all the articles. Following them is the best way to read the articles in order. For some reason or another, I messed up the order that I'd carefully planned ahead. The articles are about the "Gordon Davis" war paperbacks by Leonard Levinson and the war-themed science fiction written in Finland plus there are three book reviews, one of them being about the book I compiled, Kari Suomalainen's crime stories. I've watched all the film noirs the Finnish Broadcasting Association has been showing in the theme series for the past few months, but for some reason I've neglected to write about them. I'll try to remedy that, but a short post will have to suffice for two films. Richard Fleischer's The Narrow Margin, although excellent at times, is not really a film noir. It's more of a thriller, with a hardboiled hero. But noir? No way. Charles McGraw is one of the most hardboiled guys ever (he would've made a great Mike Hammer) and his action throughout the film carries some noir overtones, but all in all the film's just a thriller. Yet the film is of great beauty. Some of the scenes carry the solemn grace of a silent film, of a Dreyer or a Sjostrom. I got into a debate with a friend of mine whether the ending was believable, but I said it doesn't matter when you're doing something this beautiful and touching. I found myself crying in the end.